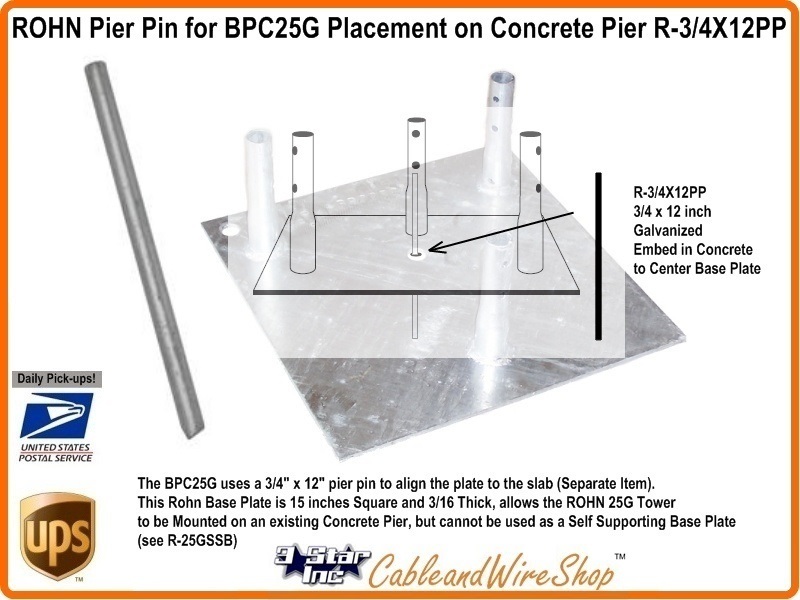 The BPC25G and BPC45G relies on a 3/4 inch DIA x 12 inch long Galvanized Steel pier pin to align the Base Plate to the slab (Base Plate is a Separate Item) and thus allows the ROHN 25G or 45G Tower to be Mounted onto a Concrete Pier. Neither Concrete Base Plate can be used as a Self-Supporting Base Plate (see 25GSSB). This Pier Pin is also used with 25TG and 45TG Tapered Base Sections. This Tower Base uses double bolted joints which are proven to be the best method of joining tower sections for sturdiness and dependability. The 25G and 45G tower can be used inguyed, self-supporting or bracketed configurations according to specifications in the ROHN catalog. Consult ROHN Catalog Links at Footer Section below for ROHN 25G Tower Details. Note: The Pier Pin as utilized with this Concrete Base Plate is not really a structural load member, but simply a means of fixating the position of the base Plate as to prevent lateral movement during and after Tower Installation. Consult an Engineer for various substitution options. Hole appearing in corner of plate can be utilized for Ground Rod Location or another Pier Pin for more alignment exactitude.